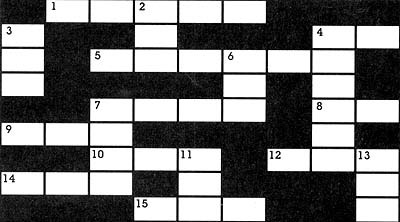 The words in this puzzle are represented by letters, or letters and numbers. Across﻿—(1) empty, (4) be, (5) canine, (7) envy, (8) oh, (9) tea, (10) see, (12) sea, (14) jay, (15) bee. Down﻿—(2) pea, (3) why, (4) before, (6) ivy, (7) easy, (11) eye, (13) are.